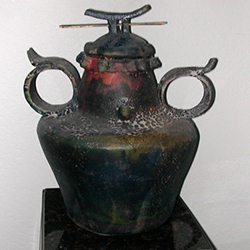 I am a novice in the field of ceramics, primarily Raku, and lapidary art. While in college I took metalsmithing and had a minor in Art History. Now that I am retired I have the time to develop my interests in these arts fields. Please see Jill's listing in the Lifestyle Artists directory. Janis's landscape paintings in oil and pastel reside in galleries in Oregon and California. Her honors include signature status in Pastel Society of West Coast, Northwest Pastel Society, Pastel Society of New Mexico and Sierra Pastel Society, and Master Pastelist status with Pastel Society of Oregon. Published in The Pastel Artists International Magazine, she has won numerous prestigious awards in regional, national and international shows. See her listing in the Teaching Artists directory. 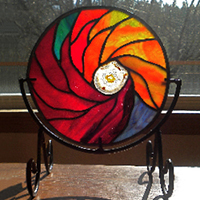 Jannie creates stained glass art and fused glass jewelry from her studio in Talent. She evolved from classical designs to her own abstract creations, frequently incorporating geode slices into the designs. Her work has been published in an art glass book featuring glass artists from around the world and can be seen in various locations in Ashland and Jacksonville.